It can be frustrating to try and open a video file but only to encounter an error message saying the video may have been corrupted. There are a number of reasons why your video file may be corrupted. This could be because of a virus that has corrupted the video file, hardware failures and software bugs. Some video files may be too important for us and it is hard to just lose the footage. In this case, you can make use of programs that fix these error messages. Here are three video repair methods working online or on Windows/Mac computer. Depending on how you get the video files, there are several reasons responsible for the corruption. The video is incomplete due to unfinished downloading. The video is damaged due to interrupted compression or decompression. The video is corrupted due to inappropriate read or write operation. The video is recovered after deletion but has been partially overwritten. Tips: While data loss is almost inevitable since we have various kinds electronic devices at hand, it is important to choose a reliable tool for file recovery. Jihosoft Photo Recovery is exactly one of the best recovery software when it is necessary to recover videos and photos from SD card. While a lot of people are familiar with VLC as a free media player, not many are aware of its hidden capability to repair corrupted or damaged video files. Using VLC player, you can repair MP4 and MOV video files by using features found in the application. VLC transcode abilities are responsible for turning damaged MP4 and MOV files into playable video files. Usually, when trying to access media files with VLC, you may encounter an error message and a prompt that asks you to repair broken files. More often, you may select ‘No’ unaware of the VLC capabilities to repair the file. Here’s how to repair your corrupted MP4, AVI and MOV media files with VLC media player. Step 1. 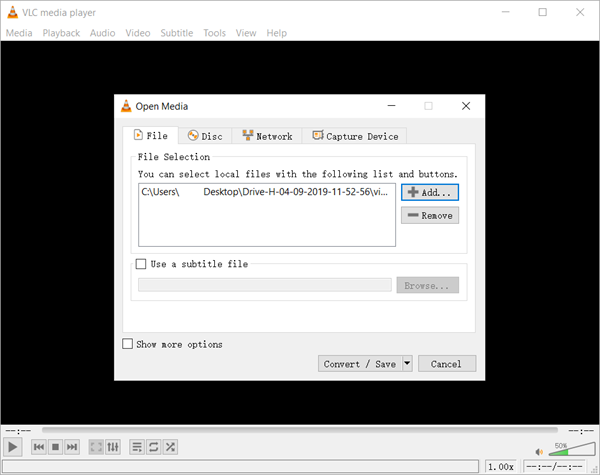 Open VLC player, then go to Media and select Convert or Save. Step 2. Add files that need to be transcoded and then click Convert/Save. Step 3. On the Convert window, type a name in Destination file box. Step 4. Click Profile drop list, and then select a desired Input Codec. Step 5. Click on the Wrench icon to open “Edit Selected Profile” option and edit settings. Step 6. Press Start to begin the repair process. VLC works a handy tool for repairing certain video files that may have been corrupted by a virus, broken header or as a result of a compression issue. However, there is no single option perfect for everyone. Check out the pros and cons below before you try it. Digital Video Repair is another free tool that can fix a myriad of corrupted videos, such as MP4, MOV and AVI files. DVR can repair video files with Xvid, DivX, MPEG4, 3ivx or Angel Potion codecs. It is only available for Windows and can only repair one video file at a time, but it features with a straightforward process that makes it easy for anyone. The user interface is simple to use too and with only a few clicks you will be able to repair your video file. With the simple set up, it also comes limited capabilities which do not make it ideal for professionals. However, for single users who just want to repair a single video file, it is a handy tool that will save you time and money. In general, it is a reliable video repair software that is totally free to use and offers just enough functionality for one-time users. FIX.Video, one of the best online video repair tools, offers a handy solution for users who are looking for a non-technical approach to fixing their corrupted video files. From all your popular devices, you can fix and recover video files that had been damaged before. This online tool fixes MP4, MOV and M4V video files with great efficiency. You simply have to choose the corrupted file and upload through the website to begin the repair process. The good thing about this method is that it can be used to repair corrupted video files from any source including broken cameras or water damaged devices such as a GoPro camera. 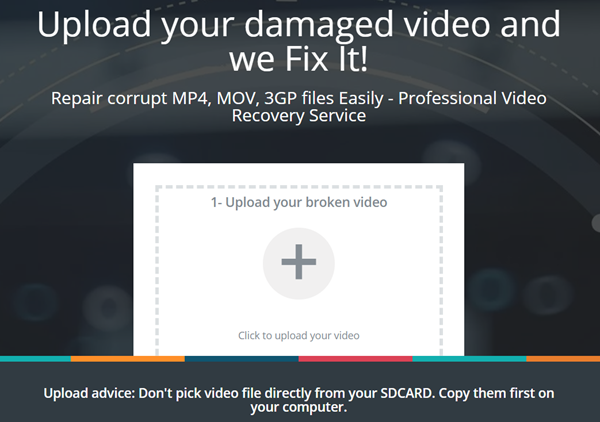 You can also restore video from a drone crash with much ease by uploading the corrupted file through the website. Note: You will need to copy your video files from SD card to your computer before you can upload to the cloud. Step 1. Visit https.//fix.video/ on your browser. Step 2. Upload your broken video by clicking the ‘+’ button in the middle of the interface. Step 3. Begin the upload process and wait. Step 4. Once the upload is done the repair process will begin. After completion, you can now download the repaired file. Can repair and recover videos from a wide range of devices including GoPro cameras, drones and dashcams. Only limited to certain types of video files such as mp4, mov, m4v, 3gp, dat, mxf files. It is very frustrating to have video files that are unplayable for various reasons including corruption by a virus, a compression issue or a partially downloaded video file. Luckily, it is possible to fix corrupted videos free either with one of the above free video repair software, or video repair online tool. Depending on the size of your file, you can opt for freely available software tools or choose a professional paid software for advanced options. Most of these tools are easy to use and will generally maintain the original high quality of the video file. If you ever have to deal with video repair, it is important that you back up the original file before you begin the process.